Reference number for this case: 30-sep-54-Vienne. Thank you for including this reference number in any correspondence with me regarding this case. 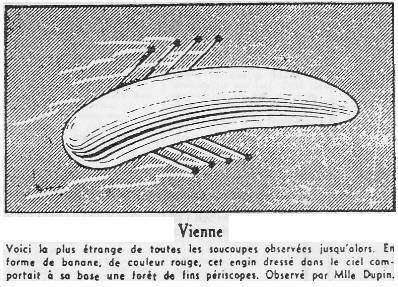 On 09/30, in the Vienne, at 9 p.m., Miss Dupin saw in the sky a craft in the shape of a red banana. Here the strangest of the flying saucers observed hitherto. In the form of banana, of red color. This machine standing in the sky comprised at the base a forest of periscopes. Observed by Miss Dupin. [fd2] Article in the national weekly newspaper France-Dimanche, Paris, France, page 12, October 10, 1954. 0.1 Patrick Gross October 22, 2005 First published. 1.0 Patrick Gross February 11, 2010 Conversion from HTML to XHTML Strict. First formal version. 1.1 Patrick Gross December 1, 2016 Addition [fd2]. 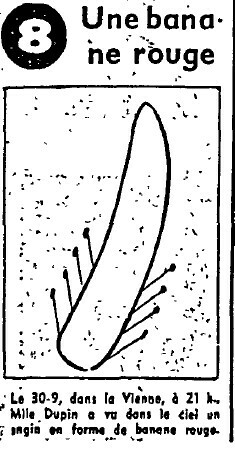 Date given to the case file.